Is current low trend in health care cost growth due only to recession? Ken Kaufman suggests that 5 other factors may be contributing. In a very interesting recent post to the Health Affairs blog, Ken Kaufman challenges the widely repeated assertion that the current low level of health care cost growth can be attributed to the recession. After decades of double digit trend, the rate slowed in recent years down to a mere 3.9% in 2010. The conventional wisdom is that recessions cause decreases in employment by employers offering good insurance and general recessionary belt-tightening includes reductions in utilization of discretionary health care services. As we (hopefully) continue to recover from the recession, everyone expects health care trends to creep back upward. But, perhaps they won’t creep all the way back up to the teens due to these forces keeping cost growth in check. Yesterday, CMS announced the first batch of 27 “normal” ACOs under its Medicare Shared Savings Program (MSSP). 93% were unwilling to accept downside risk. In the original proposed rule for the MSSP, ACOs would have been forced to accept downside risk. Presumably, CMS thought that “skin in the game” would be an important motivator for real transformative change, and they wanted to increase the chances that the federal government would be able to achieve a net cost reduction. But, in response to fierce backlash from providers saying they did not want to accept downside risk, CMS relented and introduced an option allowing providers to avoid taking downside risk in exchange for a smaller upside reward. When it came time to lay chips on the table, 93% took the safe bet. Only 18% requested up-front payment. 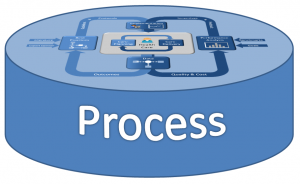 One of the complaints from the provider community during the design phase of the MSSP was that providers lacked access to the capital needed to create the infrastructure to successfully improve care processes and manage risk — things like healthcare information technology, analytics and care management. In response, CMS offered an option where ACO applicants could receive some up-front payments that would be repaid out of subsequent rewards. CMS was offering to finance the investment, but it would be a loan, not a grant. Only 18% of the first batch of ACOs selected this option. I suspect this was due to the same risk aversion that led them to accept smaller rewards to avoid downside risk. 33% used payer-based infrastructure. If physician organizations are to remain locally-focused, it makes more sense to share infrastructure with others to achieve economies of scale, rather than taking on the cost of creating their own infrastructure. As I described in a prior post, this can be accomplished through a franchise arrangement. It can also be accomplished through a management services organization (MSO), as is commonly done by PPOs and medical groups in mature managed care markets. Or, it can be done by partnering with payers who already have such infrastructure. Any of these approaches could potentially work, but I’m least enthusiastic about using payers’ infrastructure. 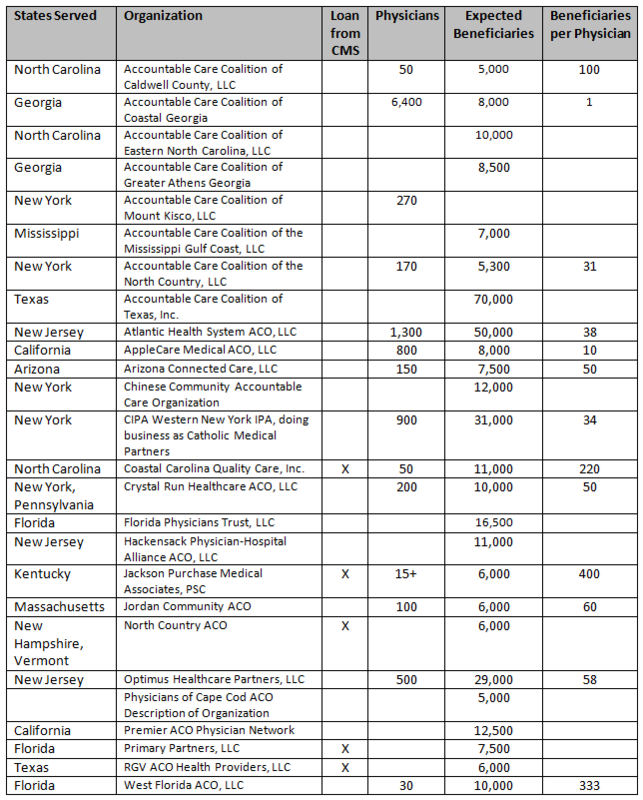 Nevertheless, nine of the 27 new MSSP ACOs are organized as partnerships between local health care providers and Collaborative Health Systems (CHS), a division of Universal American, a publicly-traded for-profit health insurance company that offers a variety of plans including Medicare Advantage plans. For these 9 ACOs, Collaborative Health Systems will provide a range of care coordination, analytics and reporting, technology and other administrative services. This is a popular option not only because of the economies of scale, but also because it allows the providers to avoid having to take out a loan, either from CMS or from traditional sources of capital such as banks or the equity markets. 44% did not note the number of physicians in their press-release blurb. I hate to read too much into such a factoid. But, for ACOs to work, the physicians must really be involved. What does it tell you if the organizers of an ACO, when drafting their little blurb for the CMS press release announcing their selection as one of the first batch of MSSP ACOs, did not think to state the number of physicians involved? Average beneficiaries per physician is 107. Of the 13 ACOs that did think to include the number of physicians in their press release blurb, 4 of them had between 100 and 400 beneficiaries per physician, 7 of them had between 31 and 60 beneficiaries per physician, and 2 of them had less then 10 beneficiaries per physician. If ACOs are to really work, they don’t just need infrastructure, they need “mind share.” If 5% of your patients are involved in some new program, and if you have not agreed to any downside risk in terms of taking on debts or being on the hook for possible negative rewards, and if the rewards are relatively small even for that 5% of your patients, are you really going to be motivated to radically transform your care processes and change your habitual clinical decision-making practices? Here’s this list, including the beneficiaries per physician calculations. Lyle Nelson from the Congressional Budget Office (CBO) has been busy. Two weeks ago, I commented on the results of Nelson’s review of 6 Medicare Care Management demonstration projects over the last decade. At the same time that report was released, Nelson also released a companion report on the 4 “Value-based Payment” CMS demonstrations over the same period. The following is my adaptation of the main results table in this new CBO report. The most influential of these demonstrations was the Physician Group Practice Demonstration (PGP). The ten PGP participants included 2 faculty group practices within academic medical centers, 5 non-academic integrated delivery systems, one freestanding group practice, and one network consisting of 60 small practices. All had experience with care management programs before the demonstration, and all implemented care management programs in the Medicare population for the demonstration. These care management programs mostly consisted of nurses serving as care managers, focusing primarily on patient education and monitoring for patients with CHF or diabetes or meeting other “high risk” criteria. Most implemented chronic disease registries for use by the care managers, in addition to using electronic medical records systems that were already in place or in the process of being implemented before the start of the demonstration. Two of the ten PGP participants received bonuses in the first year, since the Medicare expenditures were more than 2% below the expected expense. Four participants received bonuses in the second year, five in the third and fourth years, and four in the fifth year. A formal evaluation of the program conducted after the first two years concluded that the overall effectiveness of the PGP across the ten participants was about 1% gross savings in year two, and even lower in year one. Net savings, after counting the cost of the bonuses paid to some of the participants, was only 0.1% in year two. 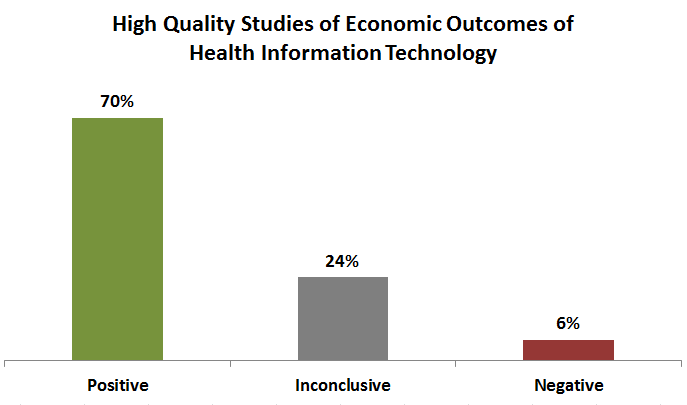 The CBO report points out that even this meager 0.1% net savings might be an over-estimate, because PGP participants changed their diagnostic coding practices, making their populations appear to be sicker, and therefore making the risk-adjusted cost targets artificially high. Such revenue maximization efforts have been job one in Medicare Advantage plans for years. The PGP participants succeeded in lifting their risk scores by 8%, which was 3 percentage points higher than the increase in the comparison population. And, the savings might have been further overestimated because all four of the PGP participants that achieved reward payments in year two already had slower than normal growth in Medicare expenditures before the PGP demonstration began. All the other PGP participants that did not earn year 2 bonuses had pre-demonstration Medicare growth that was no different than the comparison population. Despite these discouraging results, the PGP demonstration was nevertheless used as the main evidence base supporting the design of the Medicare Shared Savings Program, calling for the establishment of Accountable Care Organizations (ACOs). It is also the main evidence base for the associated Pioneer ACO program, for which 32 participating provider organizations have recently been selected. The Premier Hospital Quality Demonstration focused on 5 disease states and made bonus payments that amounted to only 0.25% of the total Medicare payments for those disease states. That’s two orders of magnitude less than the size of incentive payments thought to substantially influence performance. With such a tiny prize, it is not surprising that the quality improvements were assessed to have only a 1-5% incremental impact of process of care quality metrics during a period of time when such process of care metrics were improving nationally. And, the CBO report concluded that the demonstration had no effect on Medicare expenditures for inpatient hospital care. In fact, taking into consideration the reward payments, the demonstration led to an increase of costs by 0.3%. 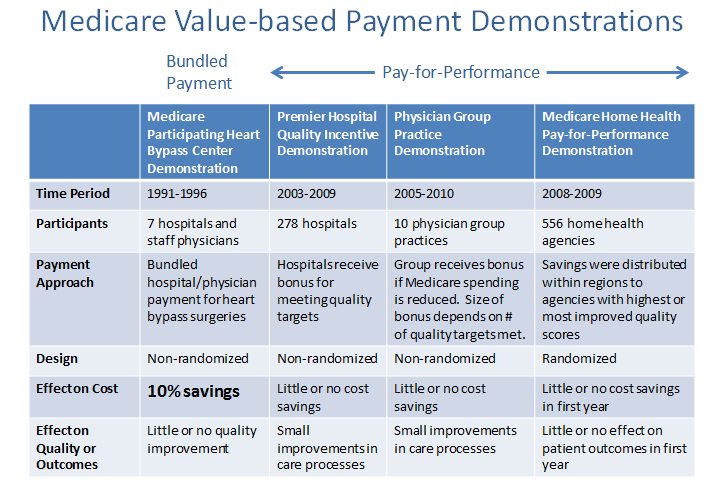 The most successful of the demonstration projects was the Medicare Participating Heart Bypass Center Demonstration, which was used as a model for similar provisions in the health care reform law (PPACA). In this program, the hospitals negotiated their bundled payments up front, ensuring that Medicare received savings compared to typical fee-for-service cases. Overall, the program saved Medicare 10%. So, where did the savings come from? It’s possible that they just came from good negotiating by CMS with hospitals that wanted to get out in front of what they saw was an inevitable trend toward bundled payment. But, let’s assume that the hospitals really had a plan to reduce their costs in proportion to the negotiated decline in their revenue. Greater reliance on clinical nurse specialists for managing patients’ care in the hospital. 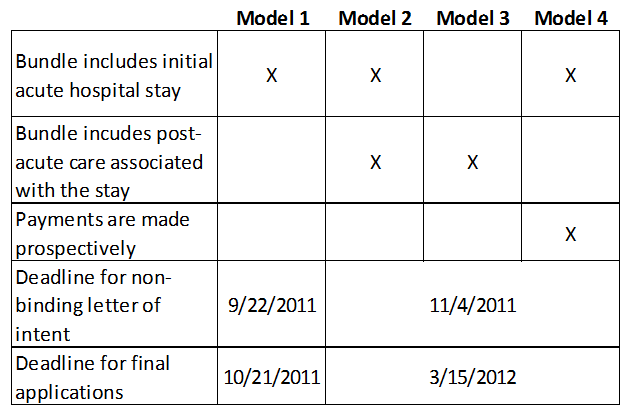 The participating hospitals substantially decreased their length of stay during the demonstration period, although length of stay for bypass surgery was dramatically decreasing nationally during that same time period. However, probably more important than these process changes was the fact that all the participating hospitals created a physician reimbursement approach that established a fixed per case payment expected to cover all physician payments. This amount was split in defined percentages among the four types of specialists involved in every bypass case — the thoracic surgeon, cardiologist, anesthesiologist, and radiologist. Any payments to other specialists was essentially payed from this pool, reducing the payments to the four core specialties. Therefore, the hospitals created a strong incentive for the core specialties to limit referrals to other specialists. This undoubtedly led to a reduction in utilization of those other specialists and the tests and procedures they generate. Therefore, some of the savings probably came from reducing revenue to non-core specialists. Don’t bother with incentives unless they are large enough to change behavior. A 0.1% reward can’t work. Nor can a 1% reward. Try 10-20%. Don’t create asymmetrical up-side only incentives. They are far weaker in terms of motivating change. And, they create a problem with paying out undeserved rewards for lucky good results. Negotiate the savings up front, rather than just creating a game from which savings might be achieved. In this 2 minute video, Harold Miller, Executive Director, Center for Healthcare Quality & Payment Reform,talks about the changes that hospitals will face during the transition to new payment models. His remarks were part of the Massachusetts Medical Society’s program, “A Path to Accountable Care Organizations: How Do We Get There From Here?”, held on Sept. 13, 2011. He argues that savings won’t necessarily come from reducing the revenues of specialist physicians, but that they are likely to come from reducing revenue to hospitals, device manufacturers and others. He says hospitals need to anticipate getting smaller, and payers need to create a good “glidepath” to make that happen without being too disruptive. I agree wholeheartedly with this principle. More generally, I am a big fan of Dr. Miller’s work. He thinks clearly about health care structures and processes, and is an effective communicator. His early framing of Accountable Care remains very useful.